Entries are now being accepted for the inaugural Dundonald Games Links Golf Day. This unique eighteen hole handicap stableford event is open to both ladies and gents and will be played over the magnificent Dundonald Links golf course in Ayrshire on the west coast of Scotland just 24 hours ahead of the annual Dundonald Games on Friday 5th of August. A website specifically for the event has been created by joint sponsors Plan B and visitors can book their accommodation online courtesy of Bookasssist. Entry forms can be downloaded or you can go reserve your fourball online and pay by Cheque or even PayPal. For those who just want to play great Ayrshire golf you could hardly do better than play 18 holes over the magnificent Kyle Phillips layout at Dundonald. 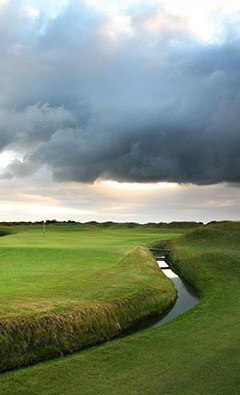 The course is a wonderful challenge but remains a fair test of all golfing abilities with fast, three club greens, some wonderul pot bunkers, an abundance of dunes and some of the best laid out holes in Scotland. The day is about enjoyment and added to the golf you will have access to the practice area and free range balls as well as Nearest the Pin, Longest Drive and the handicap stableford event - if you don't have an official handicap there are limited spaces available just to enjoy the course. Entry is currently strictly limited to 60 golfers and it is sure to be subscribed very quickly so don’t hesitate to get your application in. You can reserve a single or a discounted fourball and pay by debit or credit card. Well first off it’s not obligatory but we thought that given that it’s an official part of the Annual Dundonald Games week and the day before the games itself we’d add a little bit of fun and offer players the opportunity to compete in their kilt with a special commemorative Targe being presented to the winner of, we believe, Scotland's very first Kilted Golf Classic. We look forward to welcoming you to both the Links and the Games and perhaps an extended stay in the Ayrshire area.